Nice to see that the Salzburg Festival performances of Thomas Adès' The Exterminating Angel won in the World Premiere category of Sunday's International Opera Awards. And another festival, the Wexford Festival popped up as winner in the Festival Category. And another contemporary opera, Saariaho's L’amour de loin popped up in the new production category, in Robert Lepage's new production for the Metropolitan Opera. 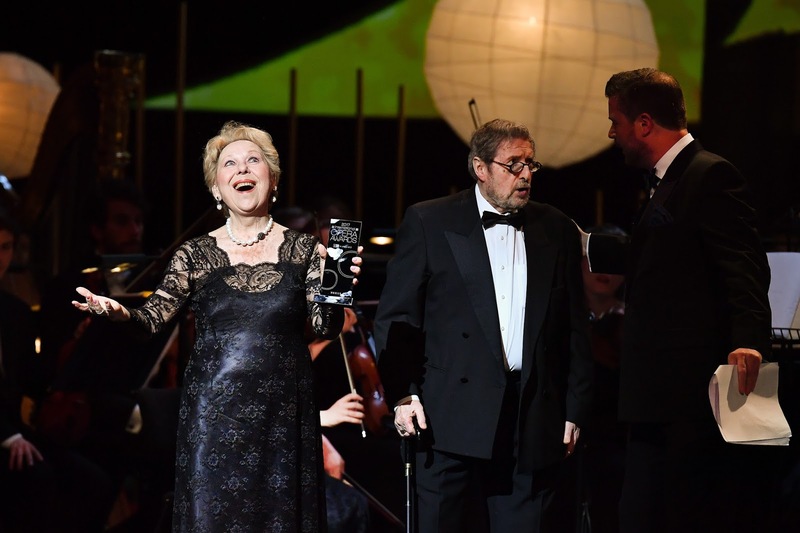 Soprano Renata Scotto got a richly deserved Lifetime Achievement Award, whilst Alberto Zedda was remembered with a Special Award In Memoriam. Anna Netrebko was Female Singer and Lawrence Brownlee was Male Singer, and Juan Diego Flórez picked up the Opera Magazine Readers' Award. The Young Singer was Louise Alder, whilst Pretty Yende's disc A Journey came in the Recording (Solo Recital) category. The evening was directed by Ella Marchment and featured performances by Stuart Skelton, Female Singer of the Year finalists Anita Rachvelishvili and Stéphanie d’Oustrac, Young Singer of the Year Louise Alder, Brindley Sherratt, Bryan Hymel, Lauren Fagan and 2014 Opera Awards Foundation Bursary recipient Rhian Lois. BBC Radio 3, which for the first time has partnered with the Awards, will broadcast highlights from the ceremony in a special 90-minute programme on Sunday 21 May at 7.30pm. Congratulations to all, and the full list of winners after the break.